Old-Florida Revisited - Nothing Is Old About It! Is the term “old Florida” a state of mind or do towns where time has stood still exist along the state’s coasts? Travel always provides a good education and affords an appreciation for many different lifestyles. There have been hundreds of writers and journalists who have undertaken journeys to find old or “nostalgic Florida”, only to realize that glimpses into bygone eras are few in the Sunshine state. I too wondered if any places I visited as a child on family vacations remained the same as they did many decades ago. One of the ways I decided to explore this question was to get-off the super interstates and follow the “roads less traveled,’’ such as U.S.
Highway 41, known as the Tamiami Trail along the West coast of the state. The Tamiami Trail is a road I can remember from my youth, traveling it in a cramped old Oldsmobile with my parents and three sisters. For this current journey only one sister and I traveled the same road and this time in a very comfortable SUV, complete with air-conditioning and many other comforts not found in our old family car. Another very different aspect of this trip was that we started from the Panhandle of Florida, where I live now, not from New York, where we lived when we visited Florida on family vacations. 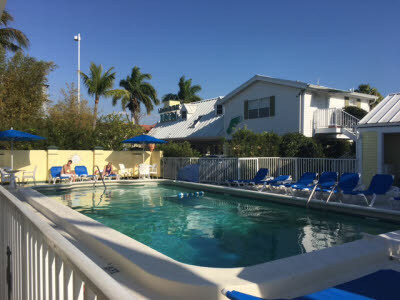 I live now in an area of Florida that has grown significantly in the last two decades from a mainly spring through summer seasonal resort to a year-round destination attracting people from all over the country. The beach towns located along the Scenic Highway 30A feature gorgeous white sand beaches, red clay soil and beautiful pine and palm trees. Tourism is still our major industry, but with the advent of technology, more and more families are relocating here because they can now combine a wonderful physical setting with the ability to work from home. Today it is still located near true swamp land, (the Everglades) but Naples is no Everglades! Rather it is a community of high-end homes and hotels. Most boast beautifully maintained yards and grounds. Its’ downtown, especially along 5th Avenue South is literally filled with elegant shops and restaurants. Naples is also a city filled with museums and other cultural outlets. There are symphonies and theatrical shows, seemingly around the calendar year. 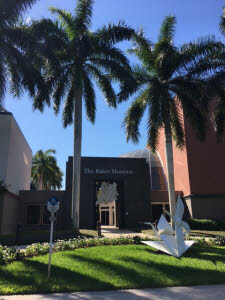 The Artis-Naples at 5833 Pelican Bay Blvd is both an arts center (The Baker Museum) and the home of the Naples Philharmonic. The center hosts more than 300 events a year. 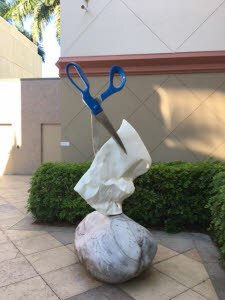 When we visited the museum was showing Robert Indiana: Now and Then (through May 3) and the Music of John Williams at the theater, along with a stage show of Something Rotten. 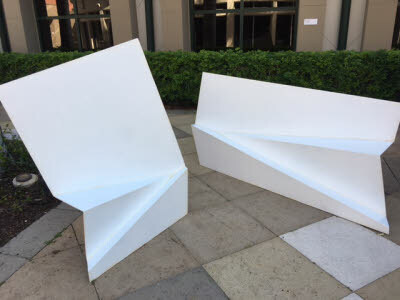 The show, Cabaret will be on stage from April 12 through 16 and a large outdoor sculpture show called Origami in the Garden will remain on display outdoors until April 23rd. This culture complex is about a 30 minute drive from the 5th Avenue South area but can be reached by traveling north along the beach road; this drive affords a first-hand look at beautiful beachfront hotels, resorts, homes and neighborhoods located west of the Tamiami Trail. 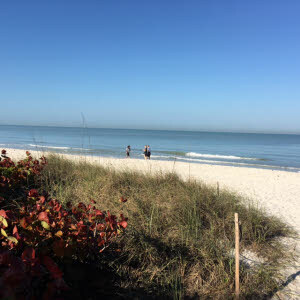 With all these attributes Naples is also no longer just a winter hideout for residents from Canada and the colder climates of the United States. Naples has branches of every major bank and financial companies, as well as branches of major department stores. 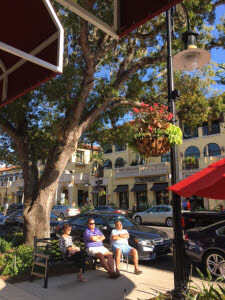 Strolling along 5th Avenue South will give visitors a feel for the ambiance of the new Naples. 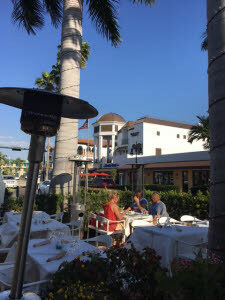 In keeping with the city’s continental ambiance the restaurants which line the blocks which make up Fifth Avenue South offer white cloth dining at tables right on the sidewalks in front of the restaurants. Street musicians add to the celebratory feel during the evening hours. 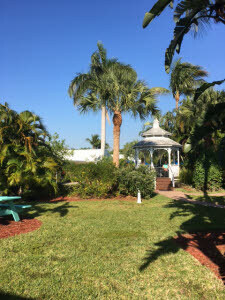 Tropical palm trees and an abundance of large vases filled with flowering plants also add colorful beauty. 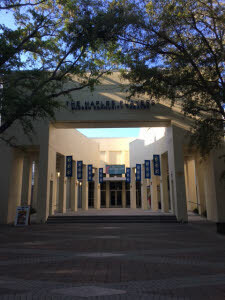 Entertaining performances can be caught right on the block at The Naples Players Theater. Beautiful stores also line the avenue. One high-end jewelry store offered free catalogs of their wares by stacking their very artful catalogs on window sills outside their business. The well-manicured blocks of downtown, which radiate out from 5th Avenue South are filled with elegant homes, some which are located on streets that end at the Gulf of Mexico beachfront. 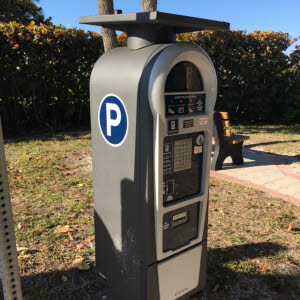 As a visitor you can share this area, providing you secure one of the few metered parking spots allotted to each street. This refreshing oasis also offers a poolside continental breakfast. Some of the cottages had a screened porch across its front. With a nod to modern day, free wireless internet is offered at the Lemon Tree Inn. Many of the Lemon Tree’s guests were Europeans. Some were couples and others had families with them. Many are return guests, who love the location; the inn’s other offerings, such as bikes and the fact that you could, with some of the units, park right at your door. Other guests mentioned the reasonable rates and the very welcoming and helpful staff as reasons why they chose this inn.